Amnesty International has called on French lawmakers to repeal an 'anti-vandal' law passed in response to violence during some of the gilets jaunes protests. The Assemblée Nationale voted in the controversial “anti-vandal” bill by 387 to 92 in February. Nicolas Krameyer, head of the French arm of the human rights' organisation called the loi anti-casseurs 'a totally ad hoc law passed in haste', and said: "There is already a sufficient repressive arsenal in France." In an interview with franceinfo, Mr Krameyer praised the Conseil constitutionnel court for censoring part of the law that banned people from hiding their faces with scarves. "The whole law is extremely problematic," he said. "If a person commits a crime ... he can be arrested. "There is a legislative arsenal totally sufficient to enable people who commit crimes in protest to be taken into police custody. But now we are telling the French, if you hide your face even partially, if you put a scarf on your nose because of tear gas, if you want to protect your privacy or simply because it is cold, you [could] be arrested, placed in police custody ... and you risk up to a year in prison. "In a state governed by the rule of law, this is unacceptable." He said current police strategies were, in part, to blame for the level of violence seen during the gilets jaunes protests. "We are facing an extremely worrying drift. Law enforcement strategies promote such violence in demonstrations. They must be punished according to the law … not for new offences that have nothing to do with the application of the law and international standards of policing. 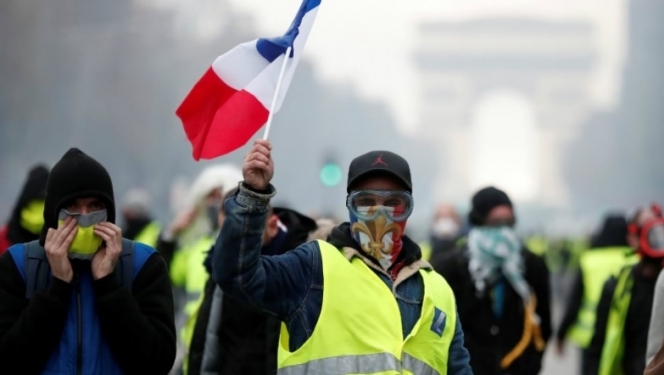 "It is not by inventing new totally libertarian laws that threaten the right to demonstrate in France that we will change anything to the nature of the violence." Reiterating Amnesty's demand for the law to be repealed, Mr Krameyer said that the least the government and police could do was to refrain from using the additional powers the law grants to arrest and detain protesters. "The French population is committed to the right to demonstrate peacefully," he added.